Mirrored Sunset is a wall hanging from the strata section of Improvising Tradition. 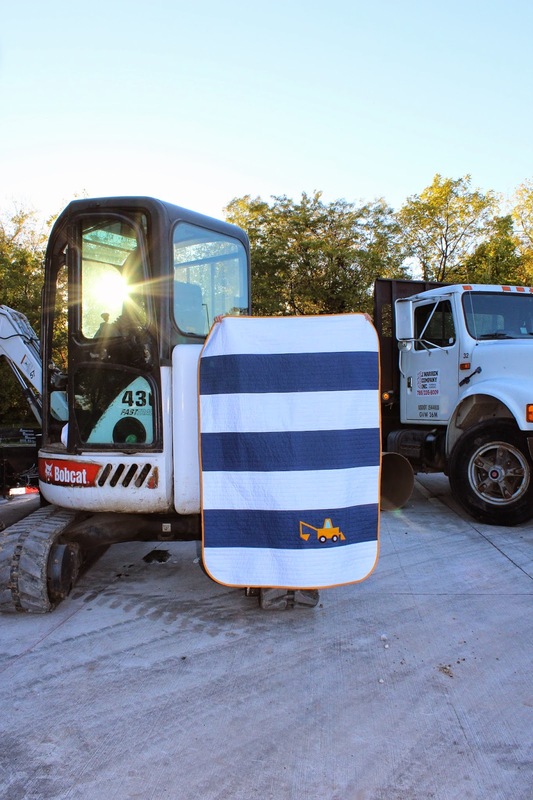 It illustrates just how versatile strata can be. 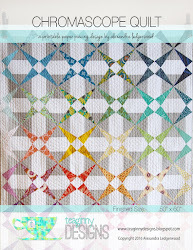 In this project I used strata as the background for a Hawaiian applique, inspired by mid century starburst mirrors. The depth of the strata comes from the Oakshott cottons. 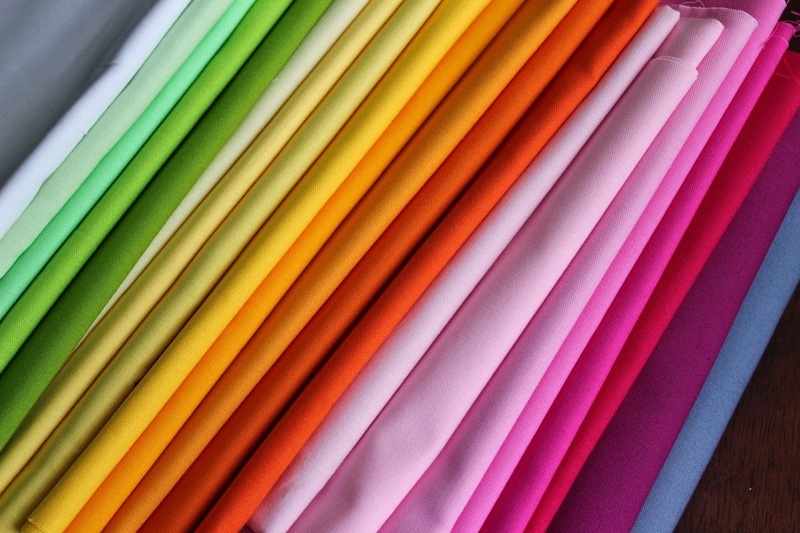 I've used them before, and these shot cotton fabrics are just gorgeous in person. 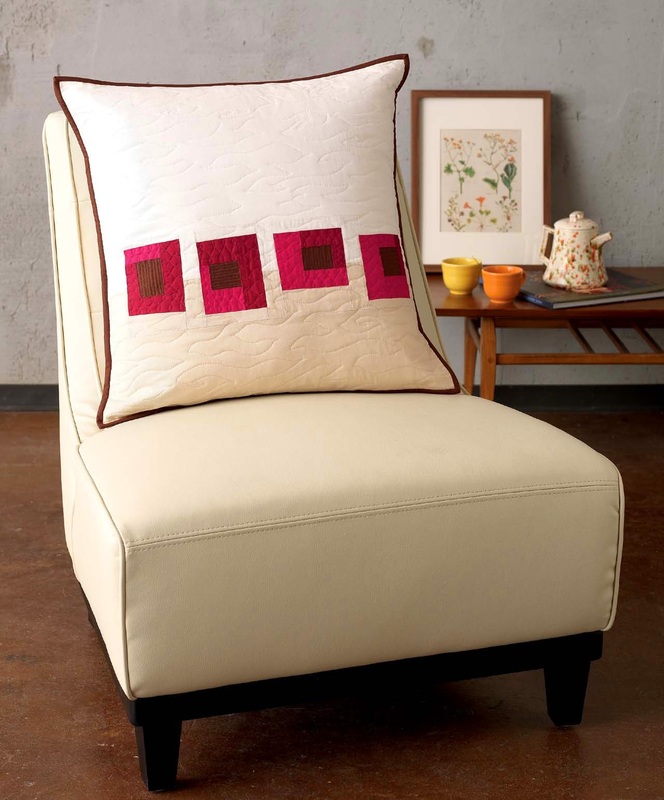 The different colored threads woven as the warp and weft create an amazing shimmer. I chose my fabrics from the Oakshott Ruby bundle. In these colors, it strikes me as very Christmassy - almost like a snowflake. Happy holidays this week everyone! If you follow me on Instagram, you've seen some sneak peeks of a free motion quilting project I have been working on this past week. 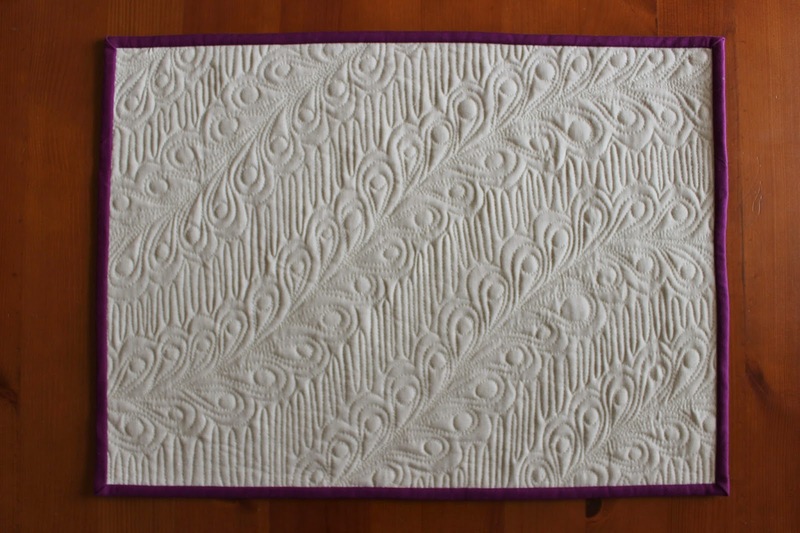 I've been trying out some completely new-to-me designs that I learned in a Craftsy class by Christina Cameli called The Secrets of Free Motion Quilting. 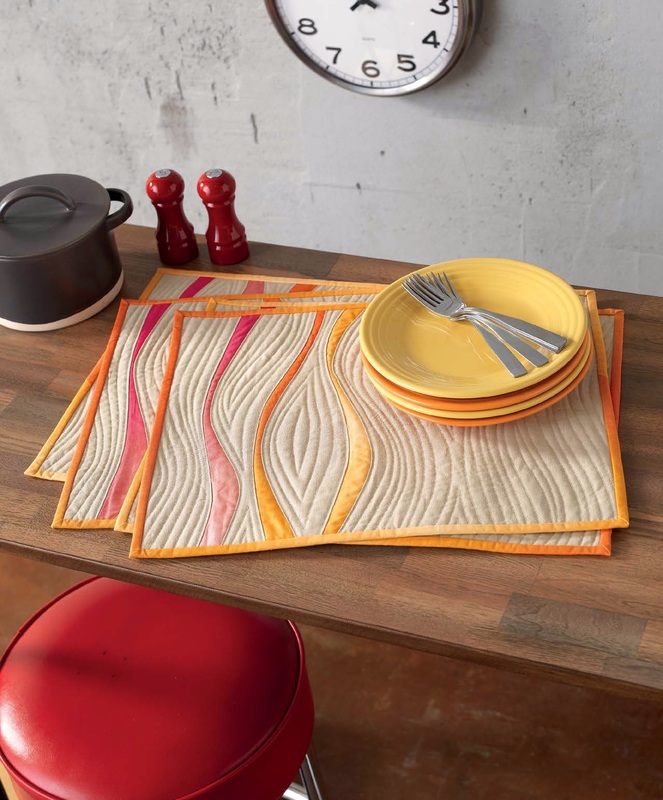 I made a set of placemats for my family using Essex linen, matching Aurifil thread, and Kona solids bindings. Christina generously offered to let me take the class and share a review with you (and a discount code you can find at the end of the post), and I jumped at the chance because I've been an admirer of hers since I found her blog A Few Scraps. What strikes me about her free motion work is the freshness of her designs. 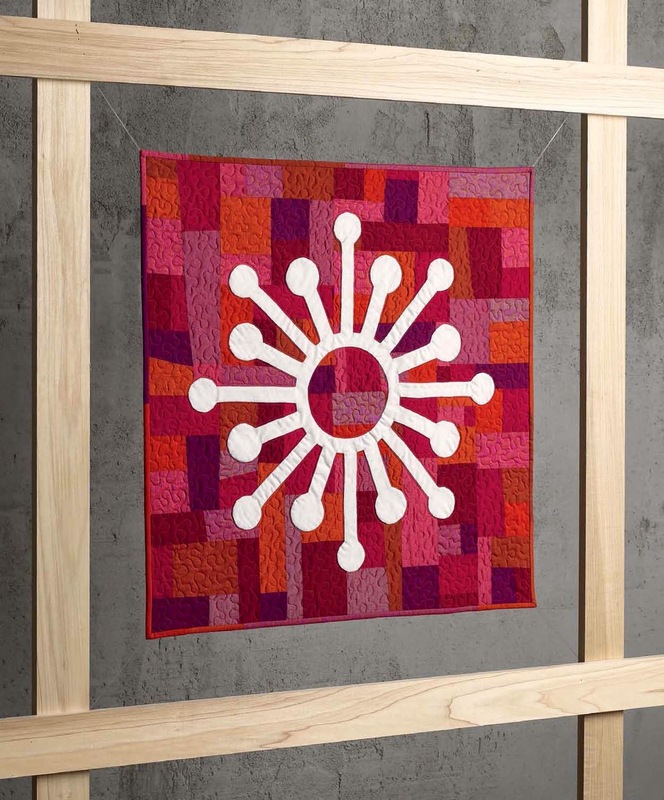 I think it is easy to get stuck in a quilting rut and use the same few designs over and over, and she uses some really unique shapes and patterns I've never seen before. 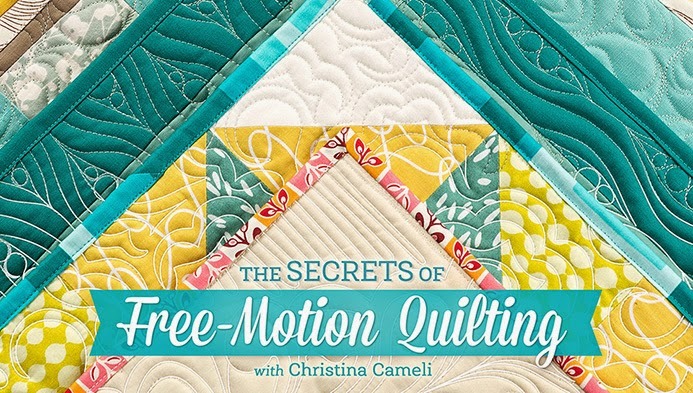 First Steps to Free Motion Quilting is Christina's book, which is a wonderful resource. Even if you own this or other books on the topic, I encourage you to try out the Craftsy class. It offers so much that expands on what a book can do. 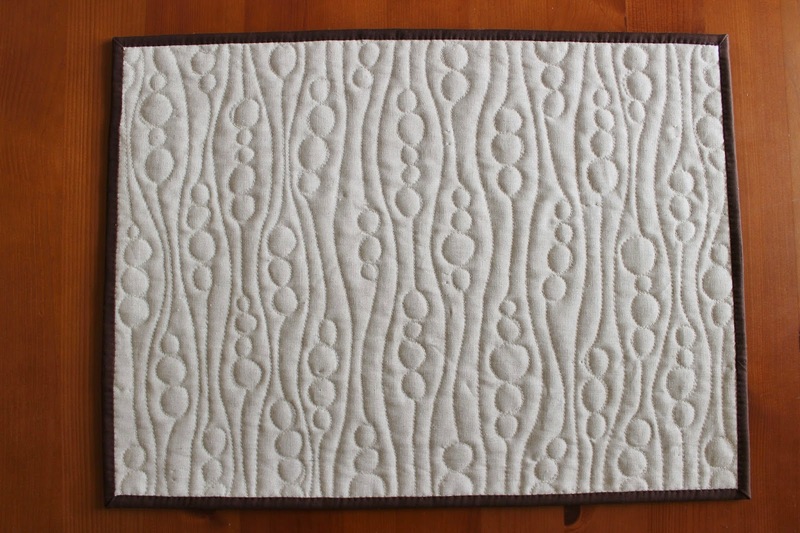 This was my first time taking an online quilting class, as well as my first with Craftsy in particular. I loved the experience! Not only do you get to see Christina's instruction, but you can post questions (which she answers super quickly! ), see classmates' projects, print out an index of the designs, and insert your own notes to return to specific points in the video later. The class is broken up into seven segments, each about 20-30 minutes long. As a mom of young kids I loved that I didn't need to leave home to take the class and could watch whenever I had a spare moment. You can go back and watch it as many times as you like too, and you can pause the video or put it on a 30 second repeat to practice a particular shape or really focus on particular movement. Christina is a wonderful teacher. I enjoyed her warm, encouraging demeanor. 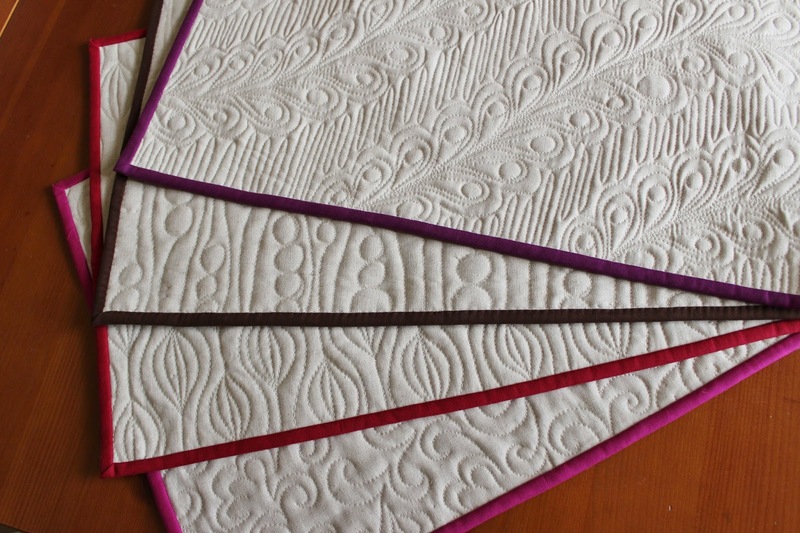 She definitely makes free motion quilting approachable and clear. I liked that she didn't edit out little mistakes but instead showed how to avoid them or overlook them. 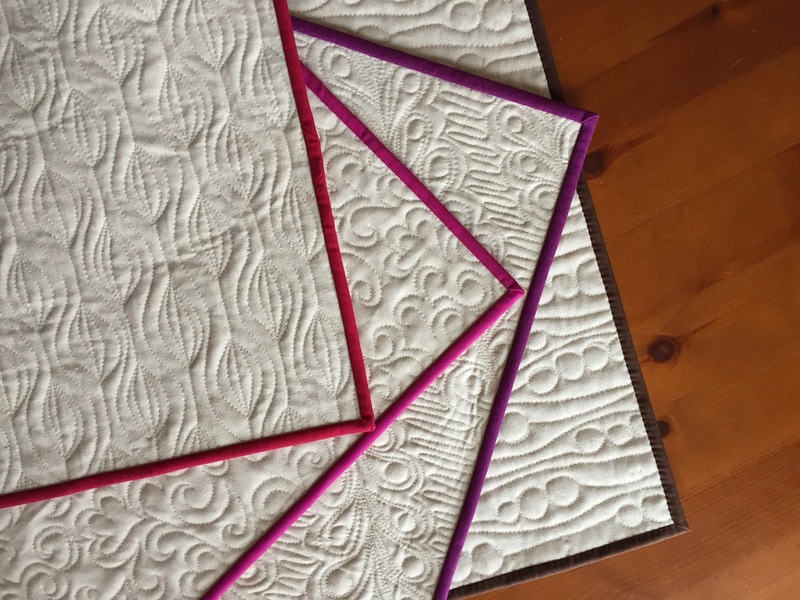 It's true that so many small inconsistencies disappear when you look at the quilt as a whole, and if she has bloopers as an experienced quilter, I feel better about my own quilting. 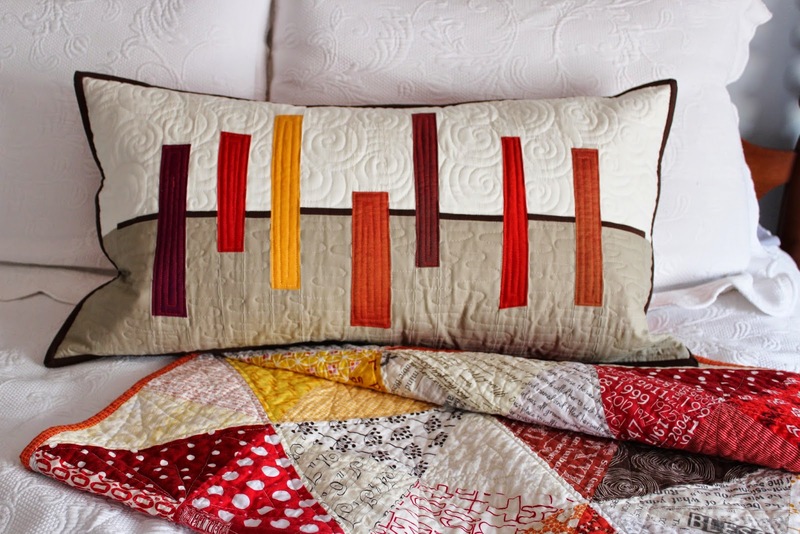 In the class Christina quilts on solids with contrasting thread, so it's very easy to see just what she's doing. She also sketches designs on a tablet, so you can see how the designs are made. Sometimes it can be hard to figure out how free motion designs are made, so Christina also shows you how to decode designs you like and figure out how to reproduce them yourself. I really can't recommend the class enough! 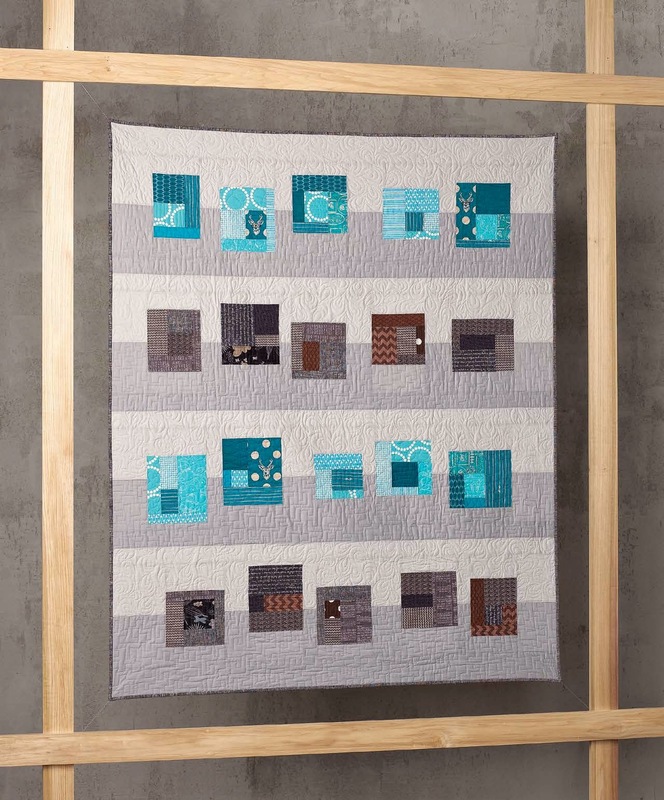 And right now, all Craftsy classes are on sale! For those of you reading this post later, Christina has generously offered a discount code of $20 off the class price (although for now I think the sale is the less expensive option, so jump on it). 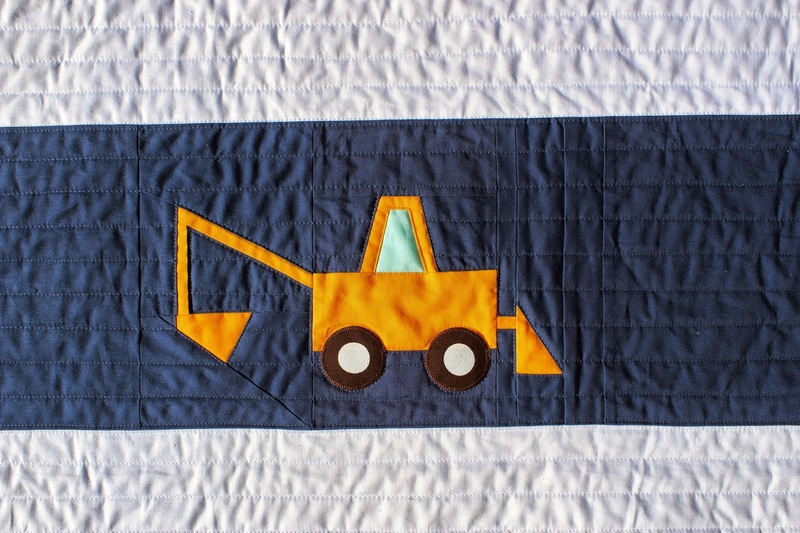 This might be my very favorite quilt from Improvising Tradition. Don't tell the others. I just love the simplicity of the design, which is really just a basic log cabin construction, and the subtle complexity added by the strata. 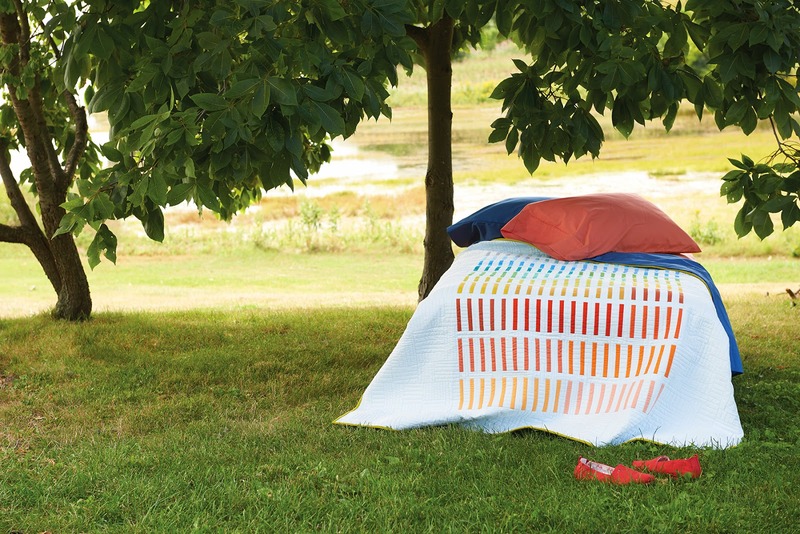 The quilt is made up of hundreds of pieces, sewn improvisationally into strata. 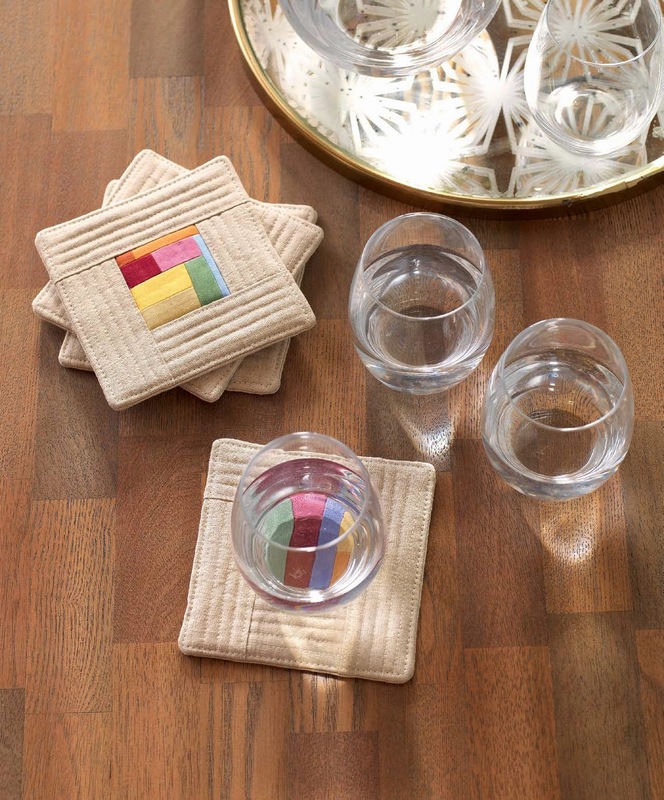 Color placement and careful value selection create the nesting squares effect. Come see this quilt and others in person, tonight at 7pm at the Roeland Park Community Center for the December meeting of the KCMQG. Several other local authors will speak about their books and show projects as well. You can purchase a copy or bring one from home to be signed. Hope to see you there! Or, you may purchase a signed copy from my etsy shop for $30 including shipping (for US residents). I'm happy to personalize your copy. Here is a second project from Improvising Tradition which uses both the strips and slice and insert technique. I call it Gameday Throw because the color blocked background and square log cabin blocks remind me of the field and players in a playbook diagram. Can you tell I'm not very sporty? In any case, the manly colors and wonky angles make this throw casual and perfect for snuggling on the couch watching the game. 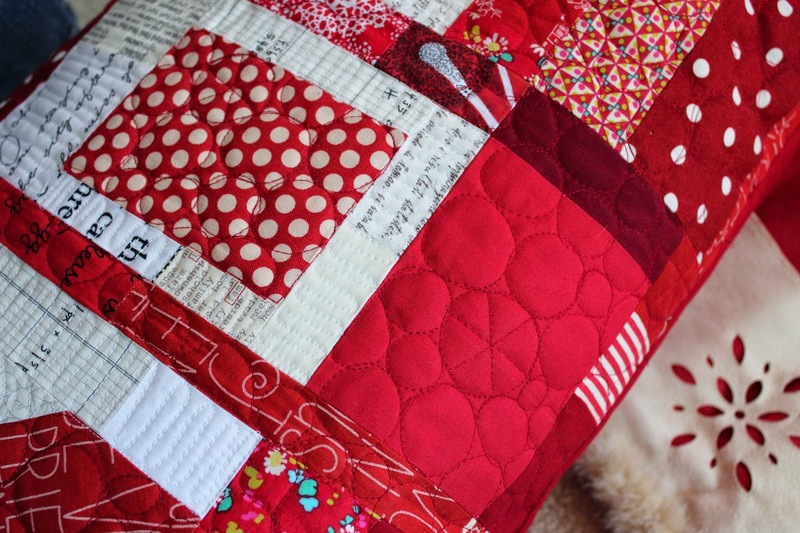 I will have this quilt with me, along with a few other projects from the book, at my first book signing tomorrow! Please come out to see me at Modern Makers at 11am. I find it easiest to take 12th street from downtown to the shop, which is at 1400 W 12th Street. The shop is on the second floor of Le Fou Flea (look for the yellow sign). You will love this adorable shop. 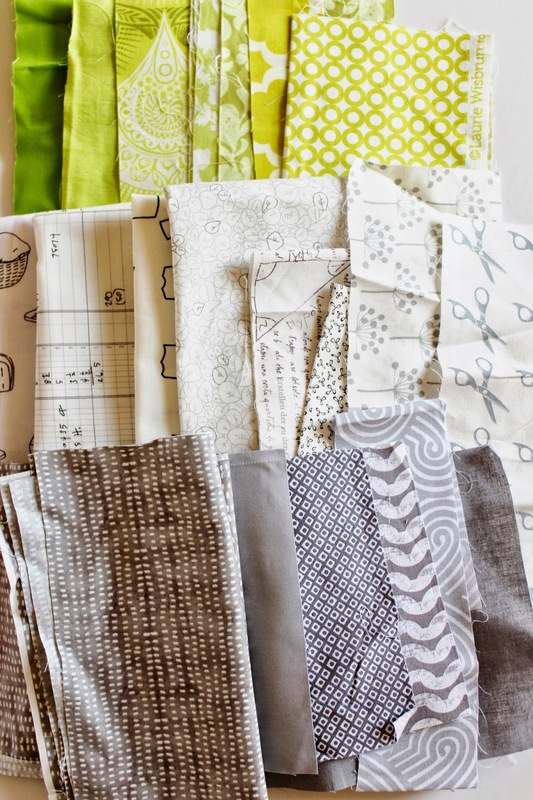 Elizabeth has so many gorgeous fabrics and notions. You can experience all the cute antique shops in the area, and since it is a first weekend, there will be yummy food trucks in the area too. So come down, have some lunch, and make a fun afternoon of it! I will have a few steps outs for anyone who is interested in seeing some techniques from the book explained. It's snowing! 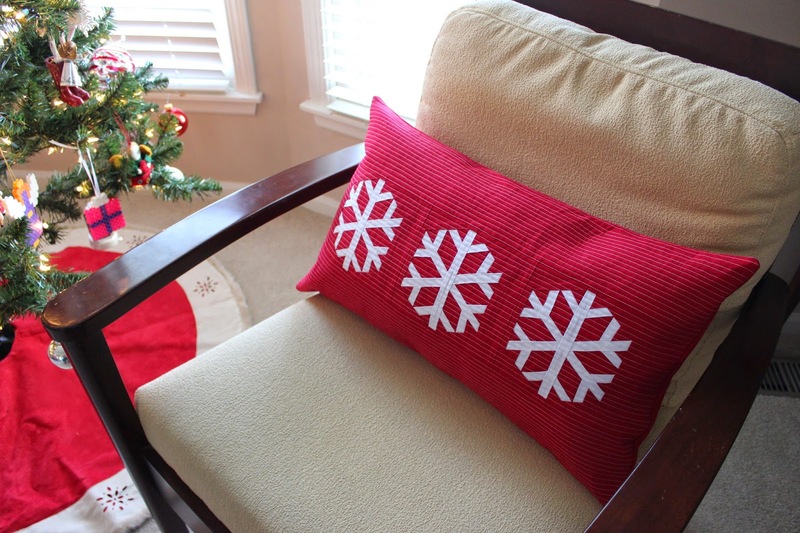 At least it's snowing in my living room with these adorable snowflake pillows. I'm feeling pretty good about checking a few handmade gifts off my list. 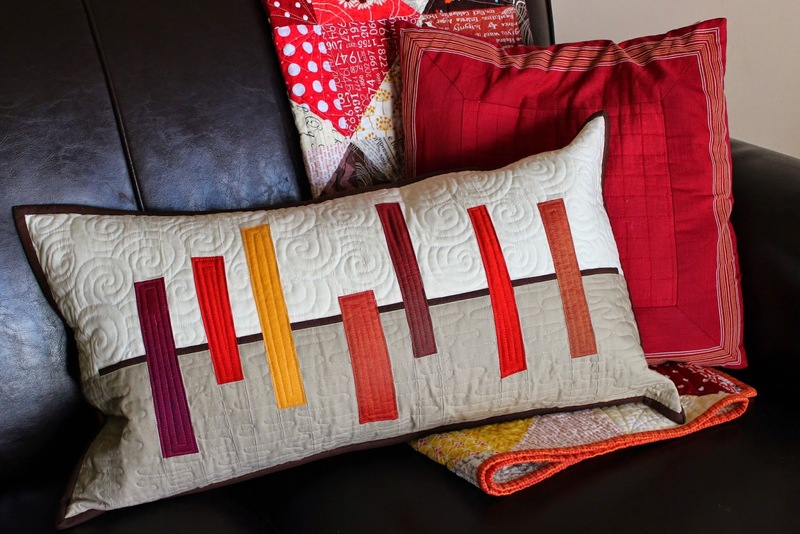 I made these pillows using a paper pieced pattern by Amy of During Quiet Time. I downloaded the pattern from her Craftsy store. 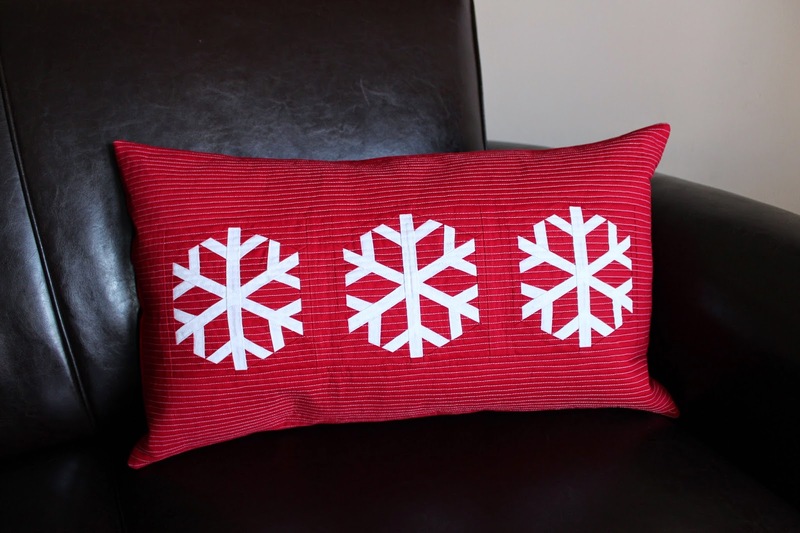 The pattern includes the block in three sizes (6, 9, and 12 inches). The small pillow above uses the nine inch size. 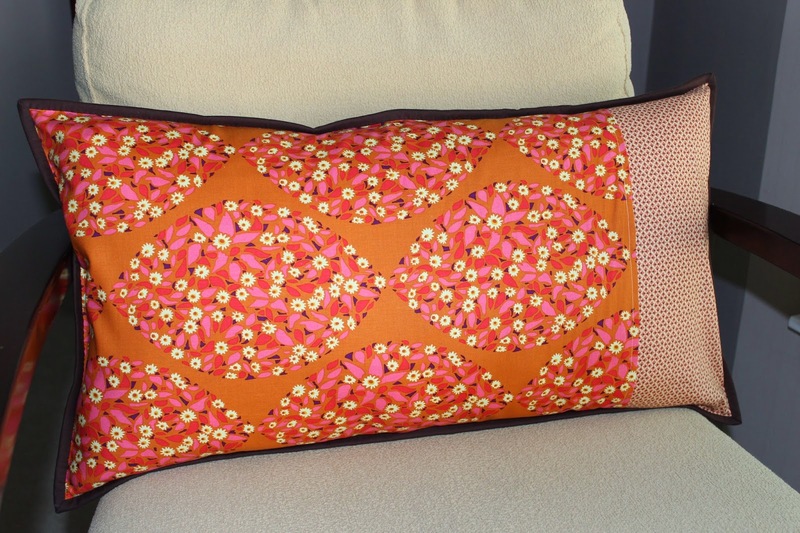 I finished the pillow with a self lining envelope back, using a tutorial by AmandaJean and some cute polka dot binding. The fabric on the back is Laurie Wisbrun's Brrr! from a couple of years back. 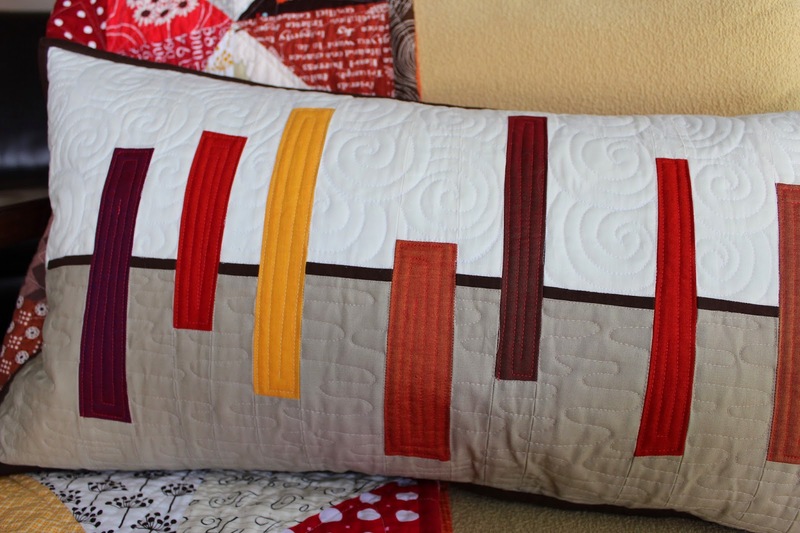 The lumbar pillow (16 x 26) uses three of the six inch blocks. 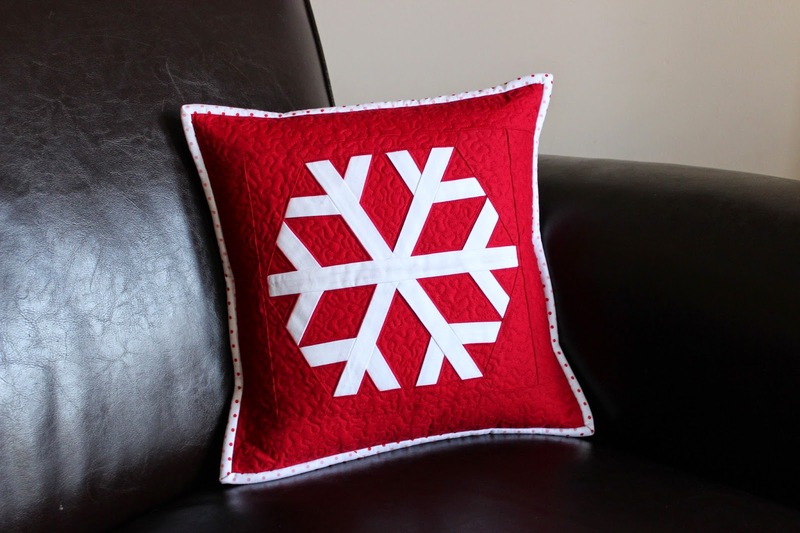 I decided to quilt it with white thread, and I like how the thread blends into the snowflakes but stands out on the red fabric (Kona Rich Red), creating a pinstripe effect. 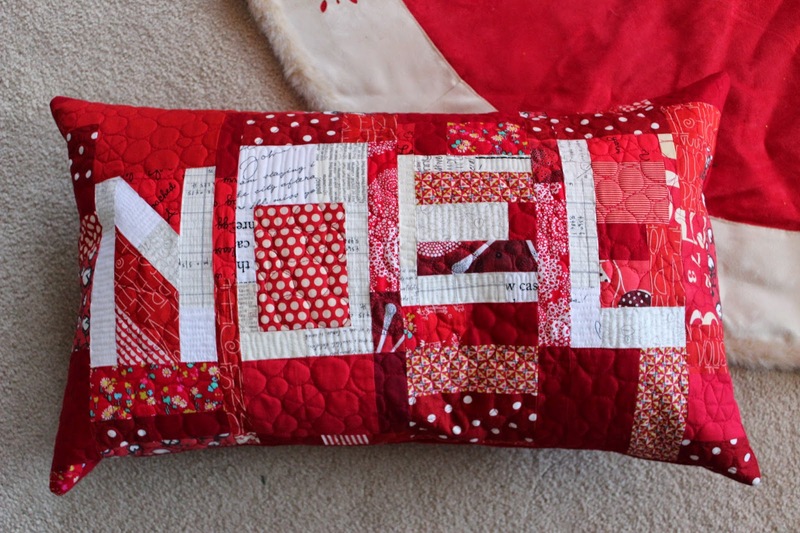 With two gifts finished, I decided to make a Christmas pillow for us to keep. I went a little crazy with my scraps and made improv letters and a strata background. It's wonky in a festive way, don't you think? 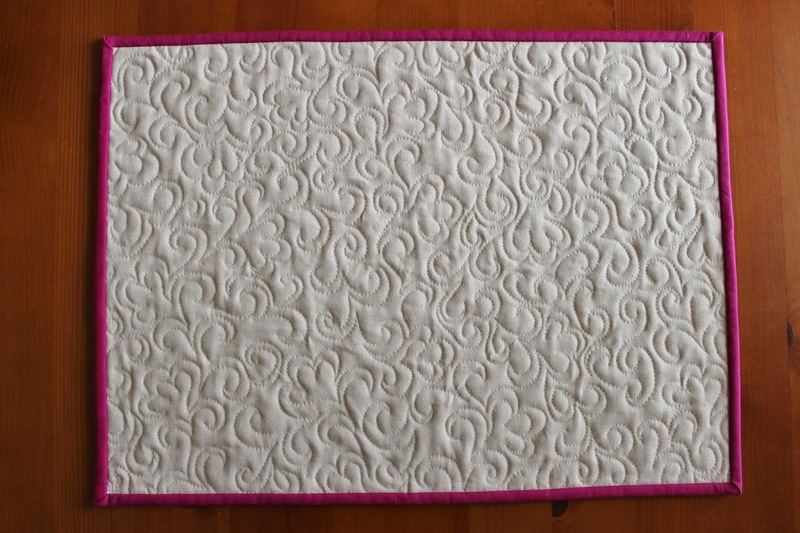 I got to play around with a new free motion quilting design I learned in a Craftsy class I'm taking by Christina Cameli. The pebbling is a fun contrast to the hard lines of the piecing, and I love the little touch the asterisk pebbles add. I'll be back soon with a full review of the class! 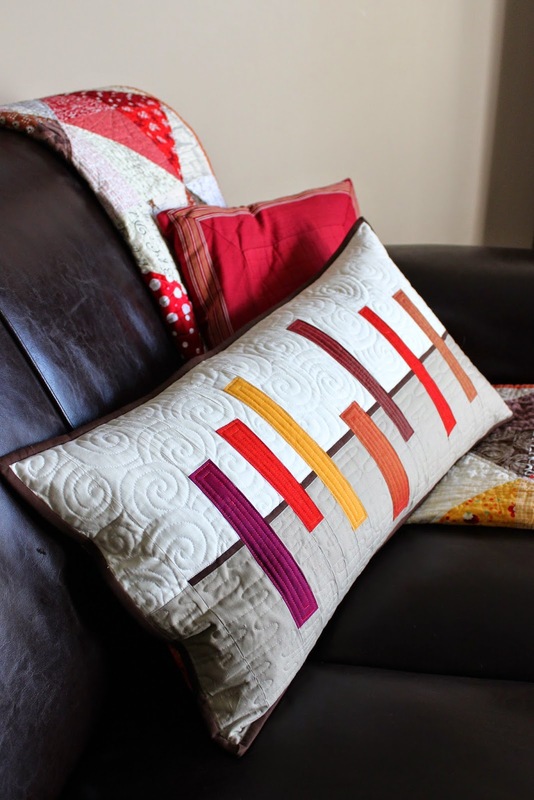 This quilted pillow is a project from my book, Improvising Tradition. 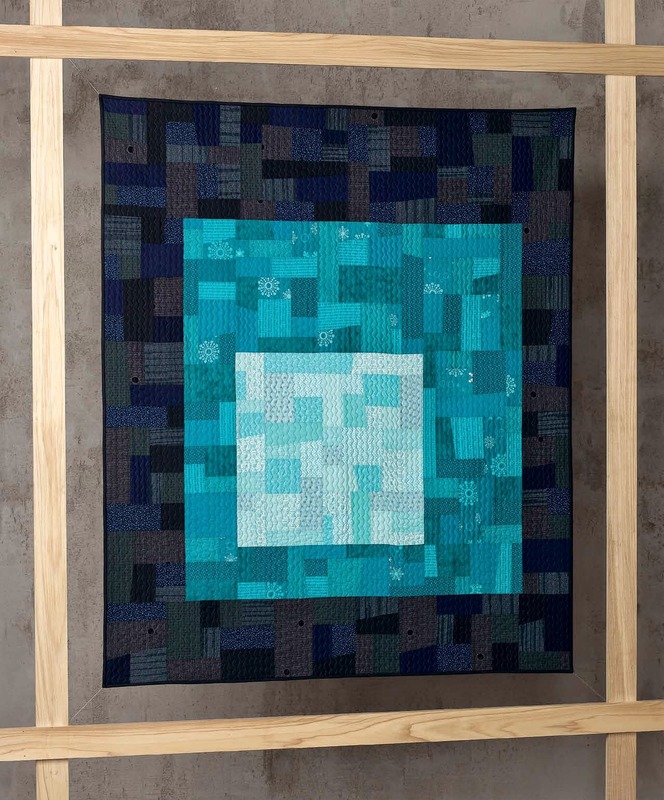 Log cabin blocks, made from strips, are a basic but incredibly versatile improv technique. With this project, I not only show you how to create wonky log cabin blocks in two ways but also how to set them into a color blocked background with a fun slice and insert method. With just a few variations, you can use this technique to create two more of my favorite projects from the book, which I will share soon. I have another new quilt to share. I created Stripes Earned as my contribution to a fun new book, Scraps, Inc. published by Lucky Spool. 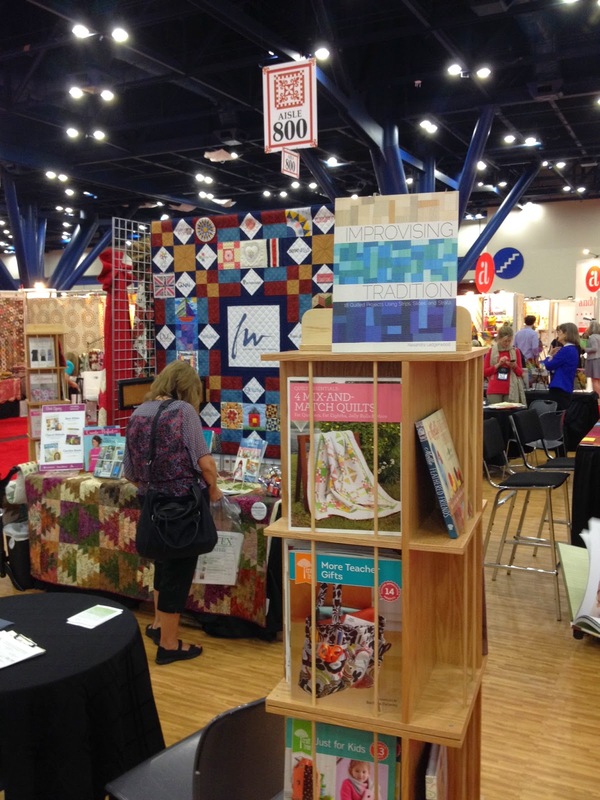 The book has 15 different block-based quilts by 15 designers, all created specifically to use your scraps. If you've been around my blog for any length of time, you know how I feel about sewing with scraps. 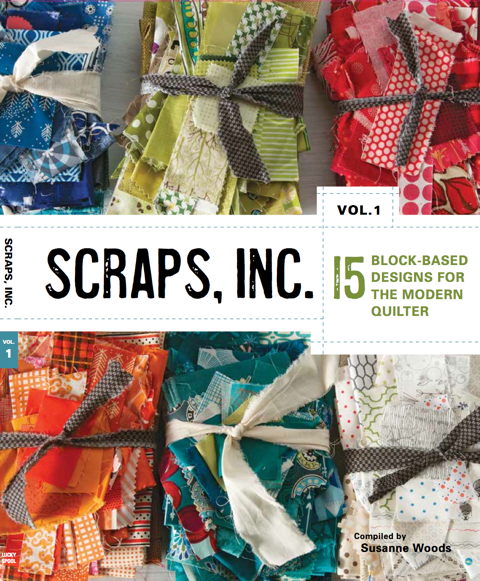 This book has so many great ideas for using the last bits of your favorite fabrics. 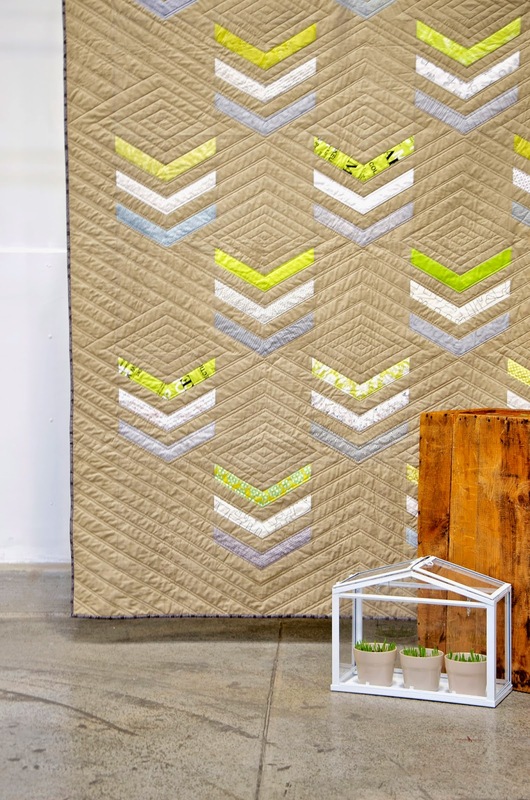 You may choose any three colors for the quilt as a whole, or use a different color combination for each chevron for a very different look. Here is a mock up in a feminine color way. I'm so excited to be a part of this terrific, useful book, as well as to be involved with Lucky Spool. It is a new publishing company, and it aims to create high quality books and interact with its writers and designers in a really collaborative way. I got to interact with the other designers in the book too, sharing ideas and inspiration via Pinterest. I'm really interested to see their blog posts in the coming week or two and to read about the story behind each quilt. 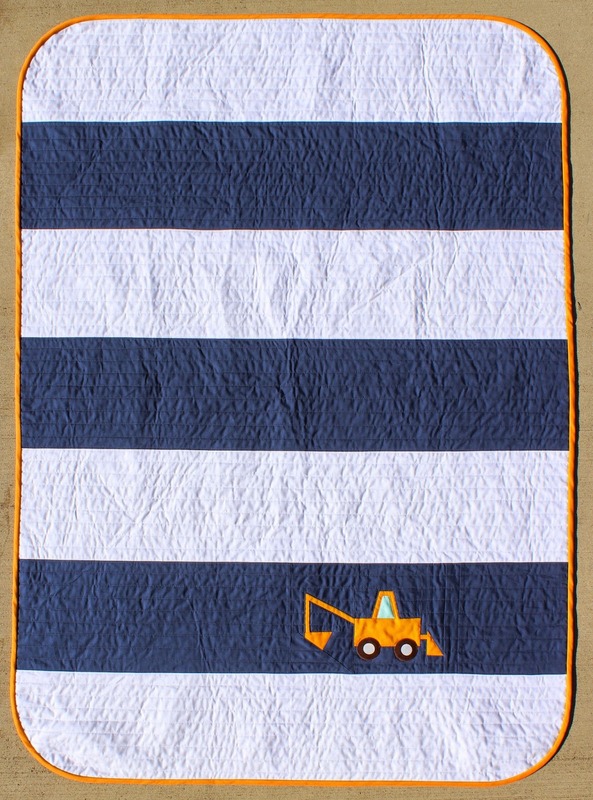 One of my very favorite quilts in the book was designed and made by Kati of Quilting from the Blue Chair. 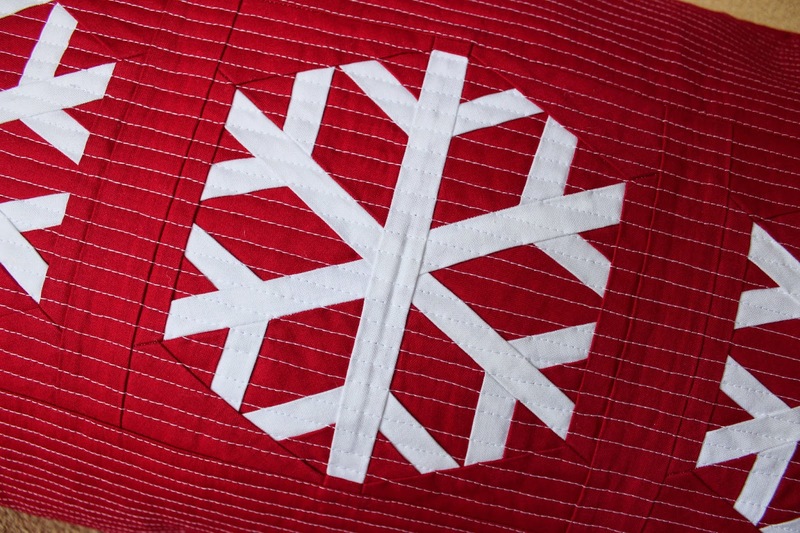 She'll be posting about her quilt next Monday, November 24, so be sure to look for that. Lucky Spool is kindly offering 30% off the book if you order by December 1st. Purchase Scraps, Inc. here and enter the code "SCRAPS30" at checkout. The winner, selected at random, is peaches1003. I'm sending you an email now to get your contact information so Robert Kaufman can send you a prize. It was fun readings about your favorite colors. Some that came up several times were Sangria, Watermelon, and Pomegranate. Many of you refused to choose (and why should you have to!?) and named groups of colors like the grays and the blues as your favorites. I agree! If you are a KCMQG member, come to Thursday's meeting for a chance at a local giveaway from me. 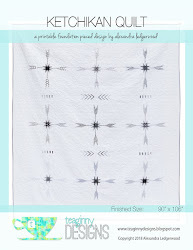 I am excited to share a new quilt with you. 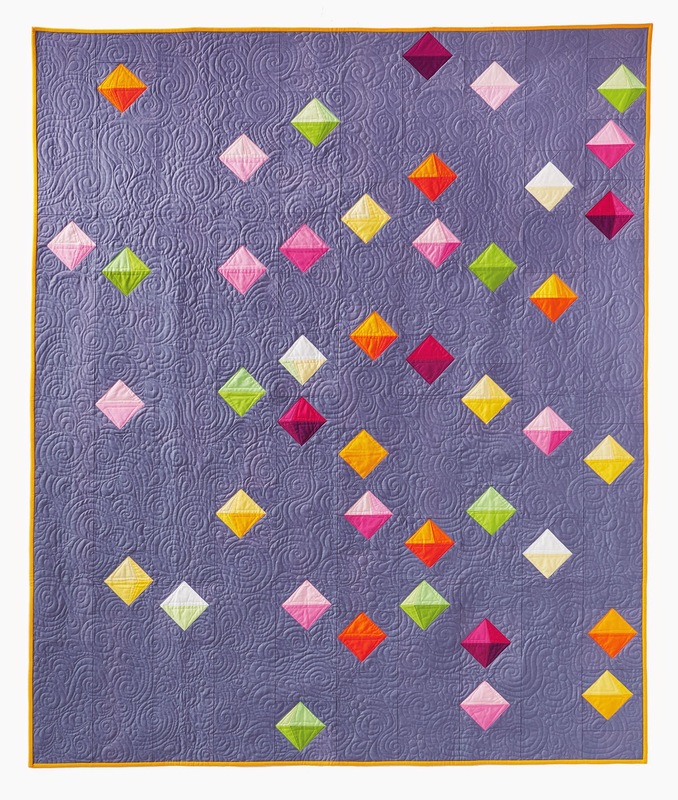 I made this quilt, Floating Prisms, for Robert Kaufman as a part of their 30 Quilts for 30 Years celebrations. 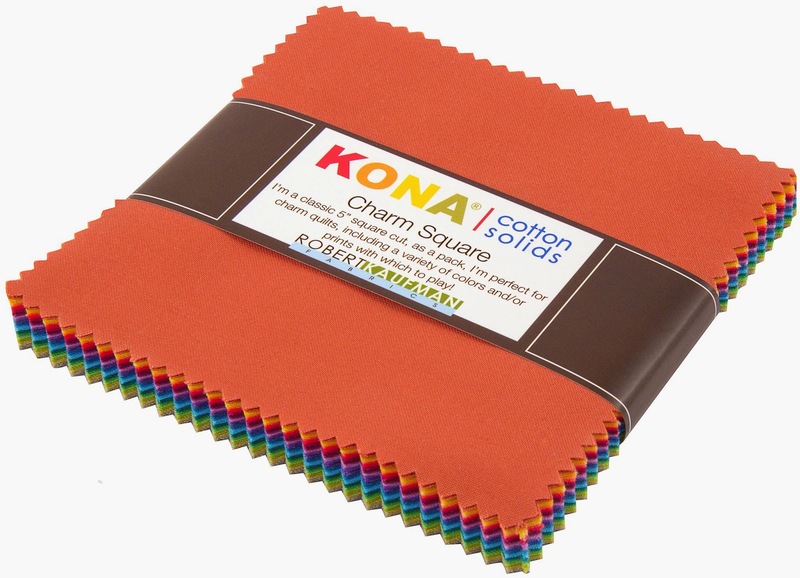 As part of the celebration, you get to see 30 quilts made by 30 different designers, using Kona solids. 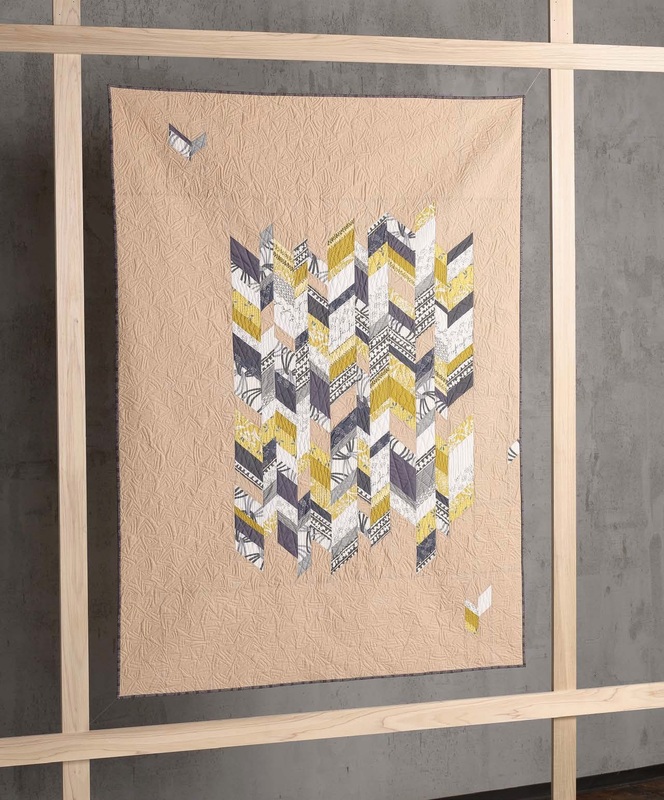 My quilt was inspired by an image of an art installation of hanging origami cubes. I love how the light hits them and how it illuminates different angles of each cube, as they twist and face different directions. I tried to create the illusion of depth with specific color placement in each paper pieced block. I used 20 different Kona solids. Aren't they gorgeous? 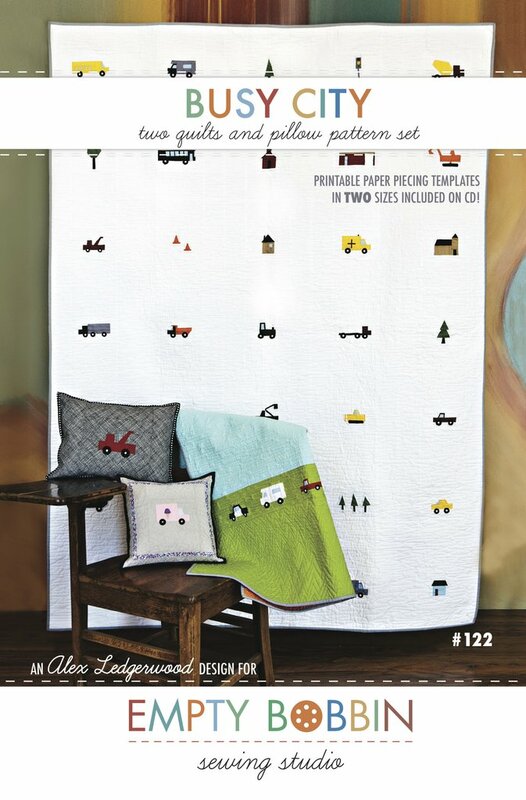 The quilt is 60 x 72 and I'm excited to say that Robert Kaufman is offering it as a free download on their website. All of the color names and fabric requirements, along with the paper piecing templates and detailed instructions are included. I explain how to place the colors in each block to achieve a 3D effect. 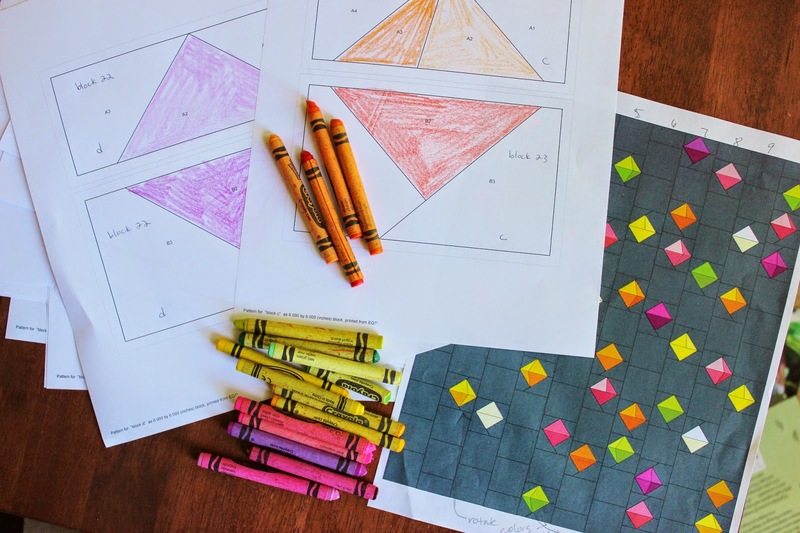 And here's a tip: I colored the templates as a visual cue to help keep my color placement on point. This fun blog hop continues until December 3rd, with giveaways at each stop and a huge prize at the end. 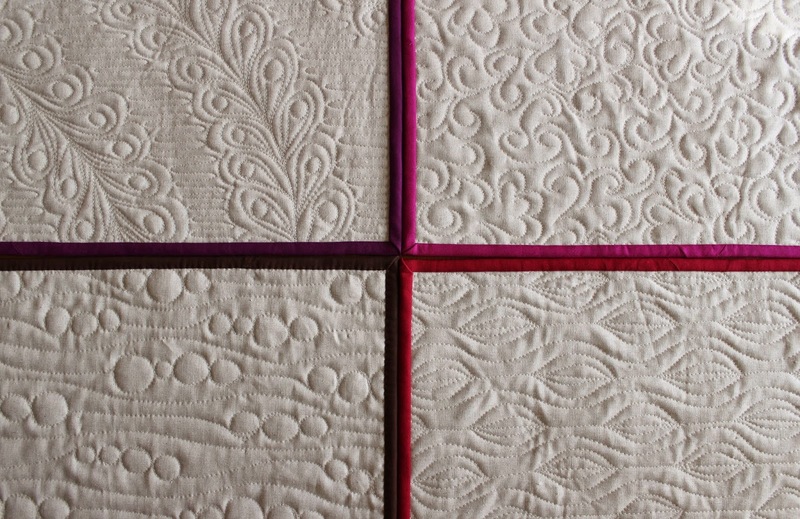 Each post features a different lovely quilt in the series. Wednesday, December 3rd: Grand Finale! 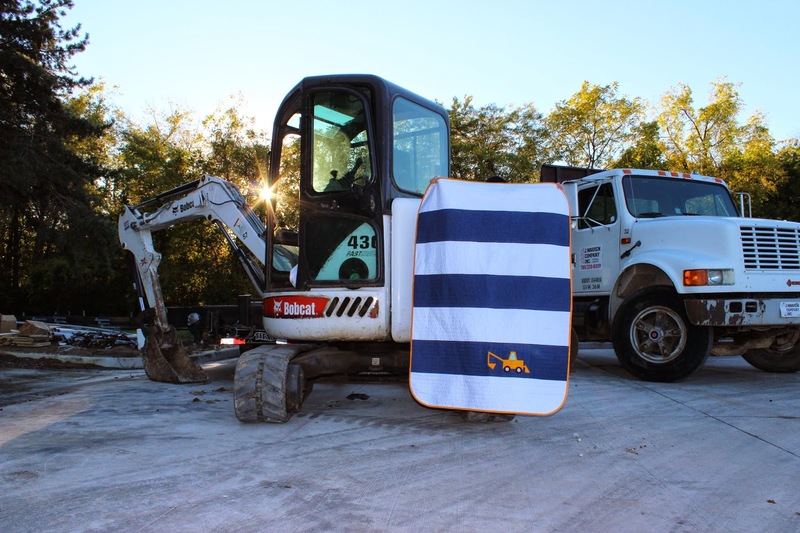 Be sure to check out Carolyn Friedlander's blog on November 29th to see my personal favorite of the bunch. Isn't it stunning? And finally, Robert Kaufman is offering a free charm pack to one of you. These are the new 2014 colors! Leave a comment for a chance to win. You can say whatever you like, but perhaps you'd like to share your favorite Kona color. Mine is Silver. I will choose a winner the morning of Monday November 10th. This giveaway IS open to international readers (yay Robert Kaufman! ), and be sure I have away to contact you. GIVEAWAY now closed. 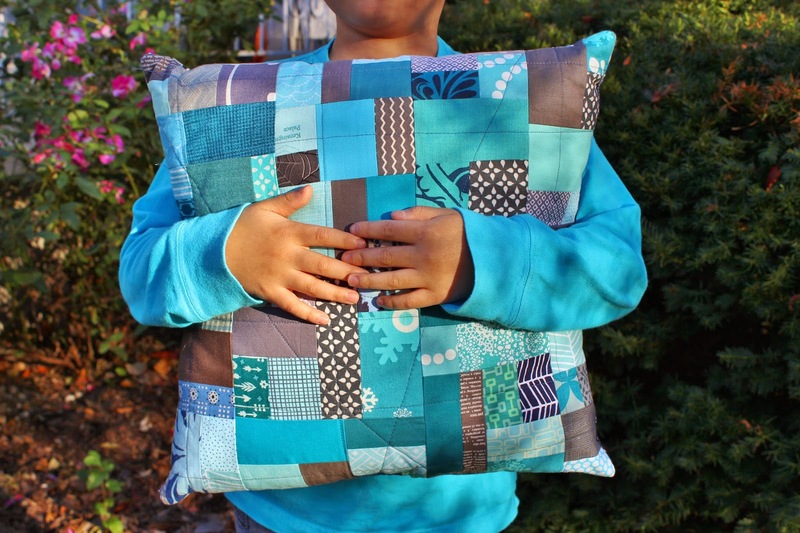 Improvisational piecing is a very liberated style of sewing which seems to really appeal to kids; it allows them to sew without a lot of rules. What kid (or adult for that matter) doesn't love making things up as they go along, entirely to suit themselves? It's just the type of thing my creative boys enjoy. My eight year old son made this improv strata pillow. He chose the pieces of fabric to sew together, chain pieced them, and constructed the top, while I trimmed and pressed as we went along. 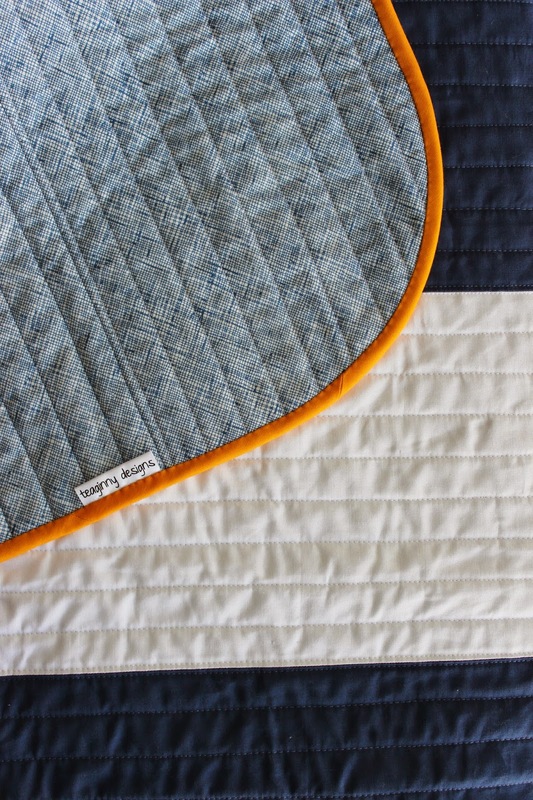 He even quilted it himself. I spray basted the top (to avoid pins and the necessity of not sewing over them!) and put on the walking foot, and he went to town quilting random straight lines in various directions. 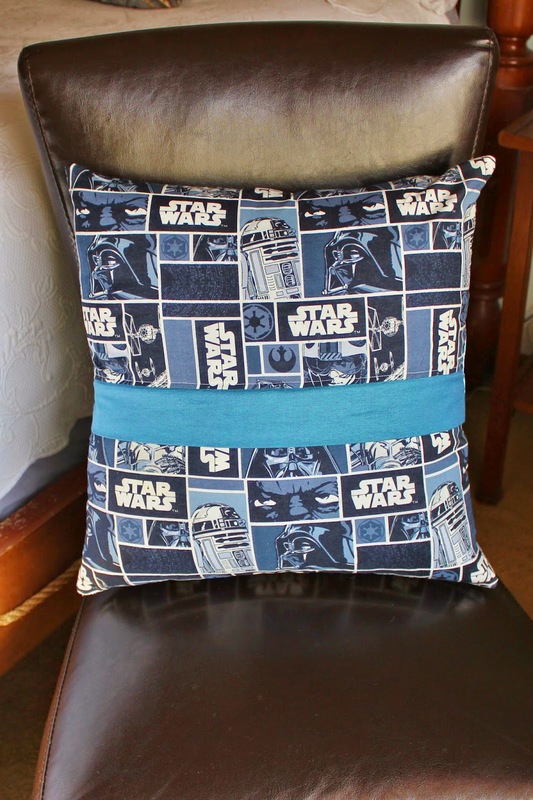 I finished the pillow with some cool Star Wars fabric and a lapped zipper (using this tutorial) on the back. My son is thrilled with his accomplishment and loves the pillow. Creating strata is a technique covered in my book, Improvising Tradition , and I hope you'll be tempted to try it out. As he would tell you, it's really fun! The minute I wrapped up the Improv Table Runner for my friend, I started thinking about making another one. 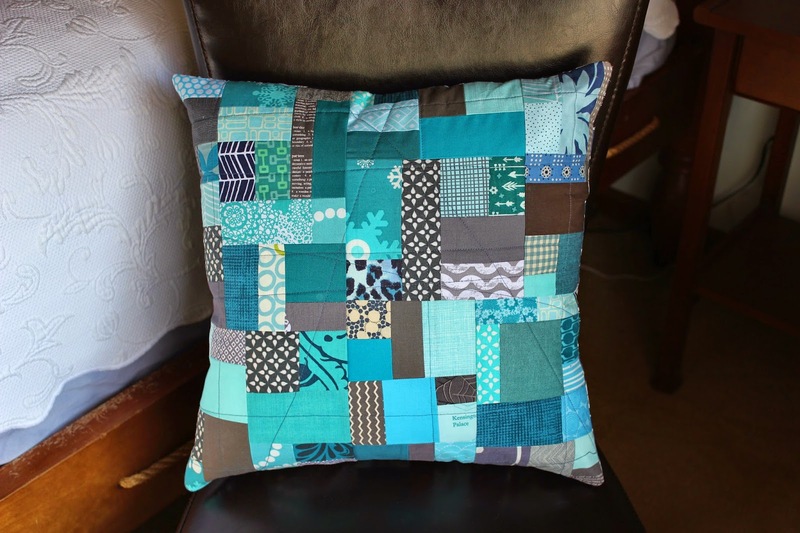 While I didn't have enough Oakshott scraps leftover to make another runner, I did have just enough to make a quilted pillow. 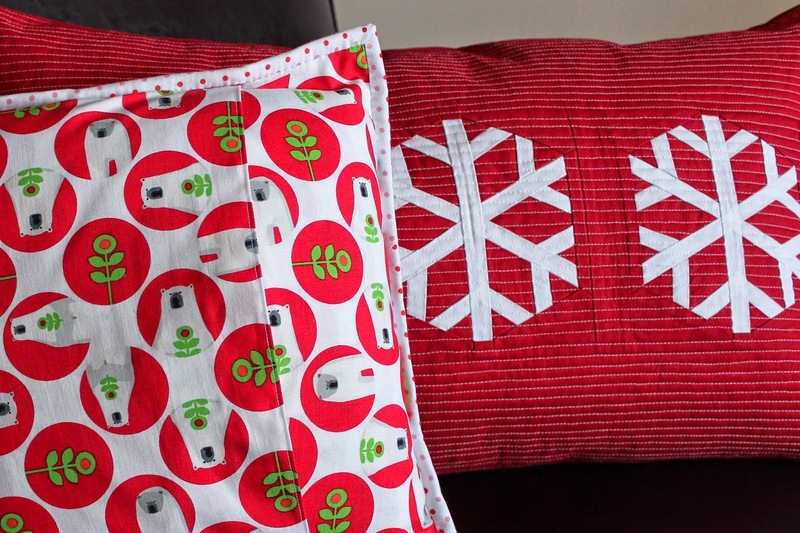 The pillows is made with the same techniques and materials as the runner. 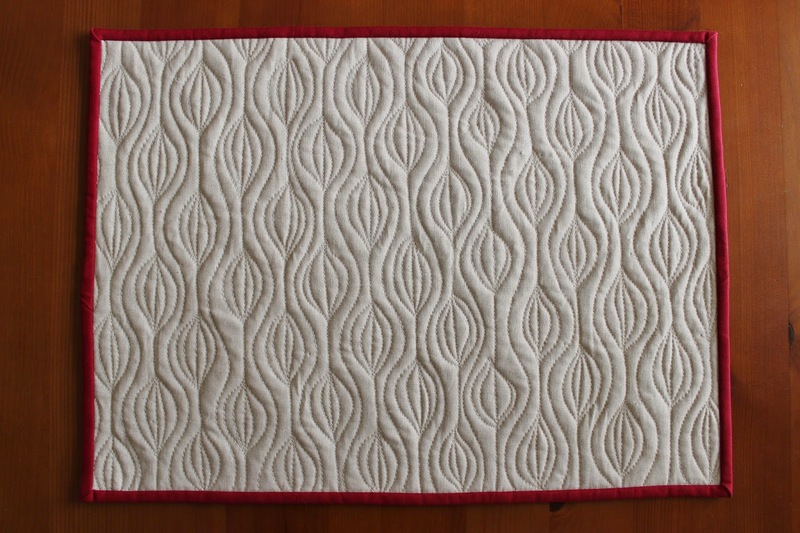 I even quilted it the same way. I just made each piece a bit smaller, of course, and I backed it with a self lining envelope closure and added brown binding. The quilted pillow cover is about 15 x 27, and I found a down pillow form at a home furnishings store that makes it super squishy and cozy. We're really enjoying our autumnal décor this month.